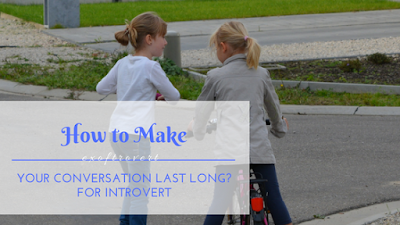 How to Make Your Conversation Last Long - I believe that sometimes an introvert try to have a conversation with other and hope that the conversation will be going well. Because like what I wrote in Introvert and Shy, What is the Difference? An introvert does not mean antisocial. Don't you? The introvert, sometimes, tries to get involved in others conversation rather than start a new conversation. It's how they are trying to get closer and get more information about people around them. But then, they don't know what to say and they don't know what to do when the silent hits in the middle of the conversation. And it is awkward. What should you do when you're in the middle conversation and the silent hits, then? First, make sure that what it is in your conversation is an information for others. Why? Because everything that people don't know will get more attention than something they already know. But, second, remember that the information you give is just little part of the percentage of your full conversation. Maybe like 25 to 30 percents. Why should it be just a little percentage from full conversation? Because if as long as what you say is all about information, then it would be a one sided conversation and it is an absolutely wrong way to have a good conversation with others. People get bored easily. Trust me that no conversation will be last long with information that repeated over and over. And people you are talking with will feels that you're not really into the conversation but it is just all about you. You and your conversation partner should feel that you're interested in the same way to have a lot and long lasting of chit chat talk. Maybe like the same perspective of something, or just have the same little hobby in craft-thing or books. Lastly, you have to know that not every topic good to add some information. Sometimes you just have to say, "It is. ", "It was. ", or "Thanks." to responds to your partner.